The fact is that in a country with an enormous federal government and a First Amendment that guarantees the right to petition the government, the swamp is always going to be extensive and unpleasantly noxious. As long as there is so much power and money in D.C., the lobbyists, the consultants, the associations, the media pooh-bahs, the contractors and the courtiers will gather and jockey for influence here. There is no neutron bomb that can be set off to vaporize them. In their book, “Unmasking the Administrative State: The Crisis of American Politics in the Twenty-First Century,” John Marini and Ken Masugi, explain the ascendance of the theory behind and growth of the administrative state which has supplanted limited constitutional government with a tyrannical anti-constitutional bureaucracy. Prof. Marini argues that the administrative state, an invented fourth branch of government, has usurped and consolidated the powers of the other three branches in the hands of unelected bureaucratic elites. It represents the living, breathing manifestation of technocratic progressive government, a system that violates the letter of the Constitution and the spirit of our Declaration of Independence. The “swamp” undermines political legitimacy by rejecting consent of the governed and subverting justice. In essence, the swamp represents an actual overthrow of our Constitution by the elites. 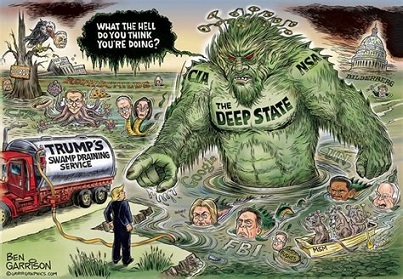 Consisting of hundreds of thousands of unelected, unaccountable bureaucrats producing millions of pages worth of rules and regulations (laws), the swamp represents an affront to our Republic and freedom. At a micro level, it creates the perverse circumstance in which an individual might find themselves up against a single agency playing legislator, regulator, judge, jury and executioner all at once. In short, we ended up with a government in which powers are unlawfully delegated from the legislative branch to executive agencies, as checks and balances collapse, separated powers become blurred, and fundamental principles of justice are shunted aside. Congress, Marini continues, willfully gave up its primary power, to legislate, potentially unlawfully delegating power to federal agencies or punting it to the courts which then enters the policymaking process as the final arbiters in cases arising in the administrative process. Talk about a dereliction of duty. While Trump is not the primary subject of the book, he is our nation’s unlikely preeminent administrative state unmasker. In spike of, or perhaps because of, his focus on practicality over philosophy, and his elevation of the forgotten man over the reflexively progressive political establishment during the 2016 presidential campaign, Trump set out to deconstruct the administrative state. While the elites mocked and derided him, they also apparently took his threat to the privileges and prerogatives conferred upon them by the administrative state regime more seriously than they did the threat of any of his predecessors. It was not just that President Trump sought to deregulate, or prescribe a set of policies anathema to our bureaucracy; he saw an existential threat to the power and prestige of our betters. The result has been a backlash that has brought the dangers of an out-of-control bureaucracy out of the shadows. In seeking to deconstruct the swamp, the administrative state has sought to deconstruct his administration and, with it, a restoration of constitutional rule. Those who have sought to subvert and sideline Trump within administrative institutions have more than crossed a red line. They are violating the consent of the governed. They are serving as a de facto check-and-balance without any such authority. They are eviscerating the last vestiges of constitutional government. If a written constitution is to have any meaning, it must have a rational or theoretical ground that distinguishes it from the government. When the principles that establish the legitimacy of the constitution are understood to be changeable, are forgotten, or are denied, the constitution can no longer impose limits on the power of government. In that case, government itself will determine the condition of the social compact and become the arbiter of the rights of individuals. If you truly want to understand what America is facing today, I highly recommend Professor Marini’s book.